If you are thinking about investing in a new garage door then you may be overwhelmed with all the terminology you are seeing. In today’s digital age it is easy to find a wealth of information – but if that information cannot be put into context it is useless. 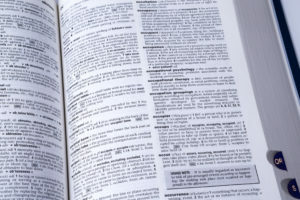 Today we are going to cover some of the commonly used industry terminology. You can always call Dynamic Garage Door at 855-343-3667 for assistance. Sometimes referred to as a counterweight system, the spring system is what actually allows you to open a garage door with a single hand. If you have door that’s been balanced well, it will weigh between eight and ten pounds. There are then two models, torsion and extension, that can help open doors. These systems last for between five to seven years before needing to be replaced or repaired. The hinges form the joints that allow the sections of the garage door to bend and then retract when pulled up across the ceiling. Larger garage doors, such as those that are upwards of 16 feet, generally have double hinges to ensure the weight of the door can be handled and the door will stay up when in an open position. Hinges are located at the end of each door section. The nylon options are the quietest. If you choose steel, it will be all about the bearings – and the more they have the better. Rollers should never slide in their tracks but should instead roll. Lifting cables lift the door, as the name implies. They are made from braided steel wires and are calibrated in accordance with the weight of the door. The bigger the lifting cables are, the stronger they are and the more weight they can safely handle. Garage door tracks can be both vertical and horizonal. They are generally made of steel and the thickness of that steel will have an impact on how well they work. The thicker the steel is, the less the chances are that the track will twist, tilt, or otherwise become damaged under the weight of the garage door. If you have a double garage door and you often leave it open for a long time, then reinforced studs are a necessity. They essentially lend the extra support that is needed for heavier doors and / or prolonged use. The thickness of the steel mentioned in all of these terms is measured in gauges. Counter to what you may assume, the lower the number is, the thicker the steel is. As a result, something that’s made with 14-gauge steel is thicker than 18-gauge steel. If you have additional questions about garage door repair, installation, or other similar services, please contact Dynamic Garage Door at 855-343-3667 right away.